April 5, 2018 – Bestbuy Distributors’ held their Shareholders Meeting and 65th Anniversary Celebration in Toronto on March 23rd, 2018. The two-day event brought together Bestbuy members from across Canada and vendors from across North America to celebrate the momentous milestone. A highlight of the meeting was the 65th Anniversary gala dinner and show. 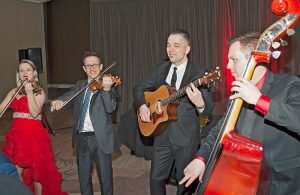 The acclaimed Painchaud Family captivated the audience with their musical showmanship. ProMax (Auto Parts Depot) was the recipient of the prestigious Horace J. Pratt 2017 Vendor of the Year in recognition of their excellence in service, sales performance and support as voted by the Bestbuy members. ProMax has received this award for the fourth straight year since 2014, and previously in 2010. Other paramount vendor award categories announced: The Marketing Partner Award was presented to Mevotech, the Rising Star Award was received by Baldwin Filters and the Cornerstone Award went to Dorman Products. A new vendor award category was introduced by Vice President Sales, Marketing & Product, Andy Murphy, called the Bestbuy Partner Award. The Bestbuy Partner Award is determined by Bestbuy’s Management team and the inaugural recipient is Spectra Premium Industries. The vendor presentations concluded with the significant and special William Elton Outstanding Support Award that was jointly bestowed to Brad Shaddick and Federal-Mogul Motorparts. 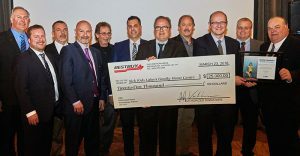 The organization also presented its annual contribution to support the SickKids Family Heart Centre which is among the top three heart centres in the world. Dr. Robert Hamilton and Dr. Mike Seed were on-hand to accept the $25,000 donation. Bestbuy has been supporting this worthy cause since 1986 and has contributed over $800,000.00 to-date. During the evening, Bestbuy had the pleasure of presenting Service Recognition Awards to members: Heimpel Automotive, 50 years; Raco Auto Supply, 30 years; Distribution Mobus, 25 years; Ramez Faizan Enterprises (VAP), 25 years; Distribution De Pièces D’Autos Rive-Sud, 25 years; Pièces D’Auto Charron, 20 years; Les Pièces GR, 20 years; Gregg Distributors, 20 years; Pièces D’Auto Guy, 20 years; and Patterson’s Parts Supply, 10 years. 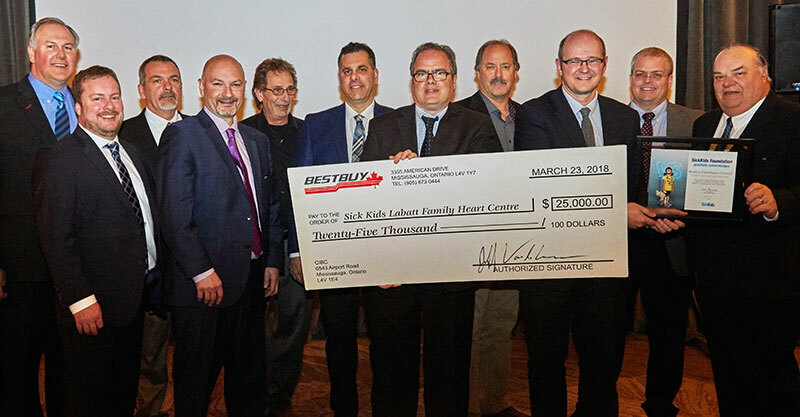 The meetings and celebration concluded on Saturday with Bestbuy’s annual trade event at their Mississauga distribution centre. It was a full house with over 90 vendor companies’ on-hand eager to discuss new business developments directly with Bestbuy members.